Jean “Jeannie” Whicher-Scott - of Lion’s Head and formerly of London, peacefully at Golden Dawn Senior Citizen Home, Lion’s Head on Wednesday, June 4, 2014. 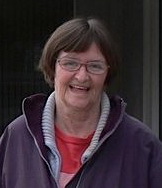 Jean Battersby Whicher-Scott at the age of 66 years. Loving step-daughter of Jean Whicher, of Wiarton. Cherished sister of David Whicher, of RR#5 Owen Sound, Maxwell Whicher (Elaine), of Lazville, BC, Monna Whicher, of Wiarton, and Ian Whicher (Rose), of Winnipeg, MN. Devoted aunt of Catherine Whicher, David Whicher (Irene), Christopher McTaggart, Sophia Whicher, and Christopher Whicher; and great-aunt of Cody, Tyler, Chelsea, and Shian. Sadly missed by her aunts and uncles, and many friends. Predeceased by her husband Larry Scott; father Ross Whicher; and mother Marjorie (nee Richardson). The family wish to express their thanks to the doctors, nurses and staff of Golden Dawn, and to the many people who cared for and supported Jeannie over the years. Cremation has taken place. A graveside memorial service celebrating Jeannie’s life will be conducted from Colpoy’s Bay Cemetery on Wednesday July 2, 2014 at 3 pm. Donations to the Canadian Cancer Society, Trinity Anglican Building Fund or Golden Dawn would be appreciated and can be made through the Thomas C. Whitcroft Funeral Home & Chapel, Sauble Beach (519) 422-0041.